Dr. Payne is a dentist whose name is a pun on the word "pain". He bears a resemblance to the Sewer Guru. He appears only in Wario's cutscene in WarioWare: Touched!. When Wario's teeth become badly hurt and start to rot after eating too much chocolate, he goes to Dr. Payne's Dental Clinic. Dr. Payne fixes Wario's teeth, Wario feels magnificently rotten, and Wario's microgames begin. After completing the microgames, Wario arrives at the Sweet Spot, where he promptly purchases and eats ten pies. 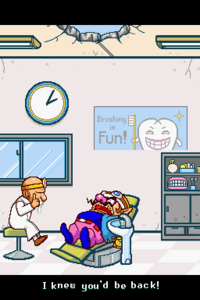 As a result, Wario gains even more cavities and returns to Dr. Payne, who was already waiting for him. Tóng Dàifu Dr. Pain. The surname 童 Tóng is a pun on 痛 tòng, "pain"
This page was last edited on March 28, 2018, at 10:25.